Facts about Scoparia Illumina Lemon Mist plant. The Scoparia Illumina Lemon Mist plant is a member of the dulcis species and dulcis means sweet. Lemon Mist receives this name because it produces a red-licorice fragrance. The Lemon Mist falls in the Scoparia genus, Scoparia meaning broom. It is a part of the Scrophulariaceae family. 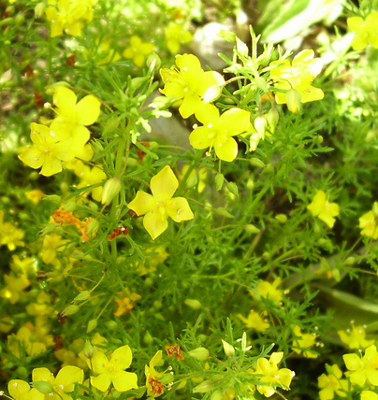 The Scoparia Illumina Lemon Mist is unrelated to the Lemon Mist rhododendron; that species produces greenish yellow funnel-like flowers in the spring. The Lemon Mist rhododendron is a cross of xanthostephanum and leucaspis. It shares the same name as the Nemesia Lemon Mist Sachet, also called Pendrop. The Nemesia Lemon Mist produces purple and white flowers with a yellow palate, and it is related to the snapdragon. The Illumina Lemon Mist plant and its subsequent breed Lemon Mist Improved is an annual that produces a small but bright yellow flower. It produces many small, star shaped flowers throughout the year until the temperature drops. Each bloom is about a quarter inch across. It has fine textured foliage. The Lemon Mist grows best in full sun. It grows equally well in flower beds and containers. They need well drained soil. It grows best when the soil pH is 6.0 to 6.5. The Scoparia Illumina Lemon Mist plants grow up to a foot tall. The plants grow up to two feet (.60 meters) across per bunch. It is considered to have medium vigor. It is considered an upright and bushy plant that mounds as it grows. The Lemon Mist has a cultivation time of eight to ten weeks for a four inch pot. If you want to put it in a hanging basket, the basket needs to be at least ten inches across, and it will take more time to cultivate. Pinching and pruning is not required for this species. The Scoparia Illumina Lemon Mist plant need to be fertilized about once a month if it is a ground plant, every two weeks if it is in a container.